We can manufacture custom or standard grates based on most Department of Transportation (DOT) requirements. We stock an ample supply of PennDOT approved grates and frames for immediate delivery. We also provide many products to the precast industry that can be used in various commercial applications. 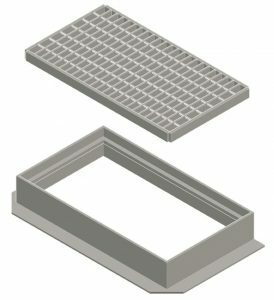 In addition to supplying approved standard grates, Laurel Custom Grating can also provide custom designed grates for use in precast or cast-in-place drainage boxes and troughs upon request. Our grates are manufactured in the USA using USA domestic materials with mill test reports available upon request.